The technology company demonstrates tenacity in a fragmented industry with their platform approach to identity management and will bring its knowledge and experience on multiple form factors and disparate systems to the FIDO Alliance community. BioConnect Joins FIDO Alliance as sponsor member. Today BioConnect is announcing it is the newest sponsor member of the FIDO Alliance. BioConnect is on a ‘Quest for Rightful Identity’ seeking to empower people to authenticate with credentials that are completely unique to them, such as their face, eyes, voice, heartbeat or fingerprint throughout their everyday lives. This unique approach using biometric authentication has resulted in BioConnect becoming a market leader in the physical access control space with over 20 release level certifications with third party software solutions. FIDO authentication standards provide an alternative to passwords and encompass parameters for biometric authentication that is secure, private and easy-to-use. To advance their mission and build out their identity platform, BioConnect developed their own framework for evaluating biometric vendors. 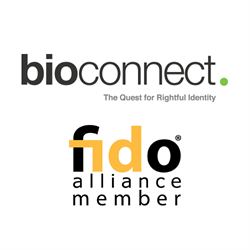 As a member of the FIDO Alliance, BioConnect is seeking to become deeply entrenched in the technology community worldwide to open up the conversation of identity and believes both their identity platform framework and FIDO authentication standards are at a stage where they are well aligned. FIDO members commit to share technology and collaborate with one another to develop open and interoperable specifications for universal strong authentication. In order for a standard to be adopted, it must transcend the boundaries of different verticals – from access control, logical access, finance, education, healthcare, data centres, mobile, IoT, wearables, etc. BioConnect intends to contribute to the development of a FIDO certification program that will allow an enterprise to evaluate FIDO compliant biometrics as it relates to security, fraud, privacy and as an authentication strategy. BioConnect is on a Quest – for Rightful Identity. Why? To empower people to use credentials that are completely unique to them, such as their face, eyes, heartbeat or fingerprint, fundamentally changing how we access applications and processes. BioConnect’s core solutions – it’s identity management platform and applications are focused on enabling the easy adoption of current and future biometric technologies, delivering greater security, assurance and convenience in our every day lives today and tomorrow. Learn more at http://www.bioconnect.com. The FIDO (Fast IDentity Online) Alliance, http://www.fidoalliance.org, was formed in July 2012 to address the lack of interoperability among strong authentication technologies, and remedy the problems users face with creating and remembering multiple usernames and passwords. The FIDO Alliance is changing the nature of authentication with standards for simpler, stronger authentication that define an open, scalable, interoperable set of mechanisms that reduce reliance on passwords. FIDO authentication is stronger, private, and easier to use when authenticating to online services with FIDO Certified™ products and services.